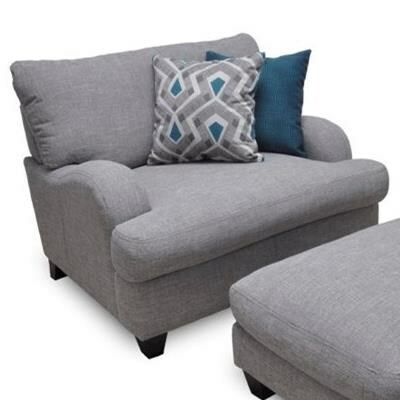 This chair and a half will provide affordability, comfortable seating and trending style to your living room display. It features swooping track arms, tapered wood feet and accent pillows that add a bold pop of color. The Paradigm Chair and a Half with Bold Accent Pillows by Franklin at Furniture Fair - North Carolina in the Jacksonville, Greenville, Goldsboro, New Bern, Rocky Mount, Wilmington NC area. Product availability may vary. Contact us for the most current availability on this product. The Paradigm collection is a great option if you are looking for furniture in the Jacksonville, Greenville, Goldsboro, New Bern, Rocky Mount, Wilmington NC area. Browse other items in the Paradigm collection from Furniture Fair - North Carolina in the Jacksonville, Greenville, Goldsboro, New Bern, Rocky Mount, Wilmington NC area.